Is that gelcoat or paint? The thick black stripes down the side of the hull above and below the rub rail, the white hull sides and topdeck, and the burgundy thin stripes between the black color are all gelcoat. The checkerboard, yellow, bright red & burgundy on the hull sides are vinyl..The center of the topdeck, dashboard are black gelcoat. My wife and I have decided to move forward with our retirement plan and buy a house in Costa Rica. In fact, we will be there in June to look at real estate. 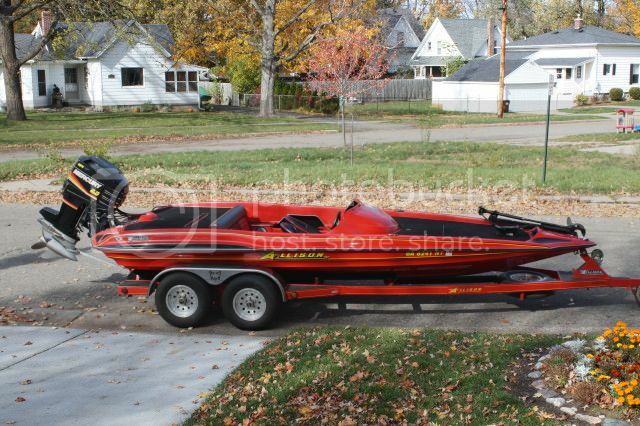 That being said, the 2800 is back up for sale but now sports a pair of 2002 low hour Mercury 250 EFI's!! Come and get it!! You know we all want to know......how much? In post #5 I listed the boat at $25k or best offer. I thought maybe the price may have gone up a hair with the new motors hanging on there. Wish i had the time and space and cash. That's a good deal. Do you have pictures of the interior of the boat?